For most of my life I've looked to food to heal me when I wasn't feeling well. Orange juice for a cold, chicken soup for achy flu-like symptoms, bananas for additional energy, etc. Pumping rainbows of ingredients into the kids since birth, I've attempted to build strong muscles with lean protein, strengthen growing bones with calcium and ward of disease with organic greens and veggies. Many of my dance mom friends (Liv dances on a local competitive team) are like minded and together we've done our best to protect our families. Much as I'd like to think of our food actions as some sort of safety net, making all the right decisions sometimes doesn't matter. Two years ago my dance mom friend Shelby began feeling a few pains in her side. A specimen of the perfect eater, Shelby only fed her family organic foods and made sure that rainbow of fruits and vegetables existed to fuel their busy bodies. However that pain didn't go away. After extensive testing Shelby was diagnosed with cancer. She underwent chemo and numerous surgeries, and last May she was pronounced in remission. She celebrated onstage at our annual studio recital, as any dance mom might, and her smile shone brighter than the lights upon her as she struck a final pose in the tap number dedicated to her remission. Shelby... the ultimate dance mom and dancer! However, the lights dimmed only a few months later with the return of the cancer around Halloween. Struggling through additional surgeries the doctors did their best to remove the toxic cells, but no treatment was enough to beat them. Thanksgiving brought visits of family along with Hospice. Today Shelby struggles to live one more day. And tomorrow she will do the same, until the cancer cells finally win (edited to note that Shelby lost her battle on March 13, 2013). Her body may be growing weaker, but the light in her eyes and the humor in her spirit are still shining brightly. Her family has surrounded her with love and last week they put together a Celebration of Life in her honor bringing family and friends together in the pure joy of her being. Shelby leaves an impact on each and every person lucky enough to be a part of her life, and while I'm not a close family friend, she will forever remain a symbol of strength and an example of someone who truly "Livs Life" to every extent of their being. I am honored to be part of her dance mom world and will never forget her beaming smile as she watches her girls dance or when she took the stage herself. 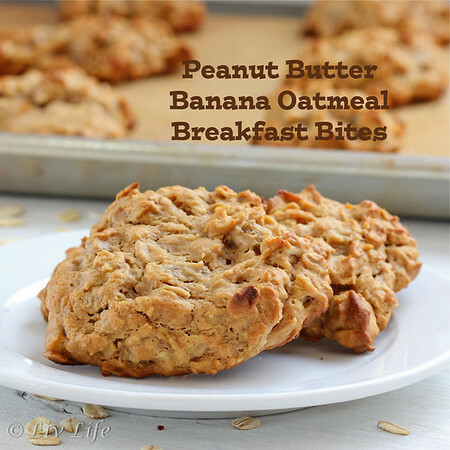 Wishing these Breakfast Cookies packed with protein, banana and fiber from oatmeal would make a difference for Shelby, I've made them for my dance carpool girls in her honor. As we enter this dance season full speed ahead, the girls need fuel for their bodies in training, but something fun and tasty as well. 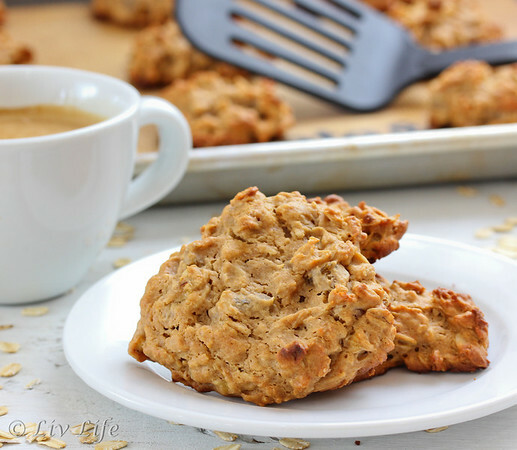 These peanut butter "cookies" fit the bill. Filled with wholesome ingredients, these breakfast bites bring a protein punch along with the health benefits of banana and oatmeal. 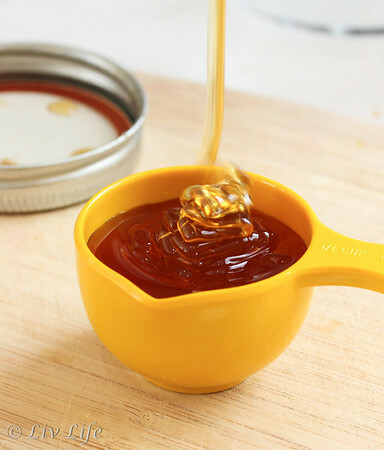 Organic honey from our farmer's market brings a sweet essence which combines beautifully with cinnamon and vanilla for a cookie-like healthy treat to get your day started in a way you can feel good about. Preheat oven to 350º. Line baking sheets with parchment paper or a silicone mat (or coat with cooking spray) and set aside. Place the mashed banana, peanut butter, honey and vanilla in a large bowl and whisk to combine. In a small bowl whisk together the oats, flour, cinnamon and baking soda. Add the raisins to the wet ingredients if you are using them, and gently stir the dry ingredients into the peanut butter banana mixture, stirring just until combined. Using a spoon, drop about 2 Tbs of dough at a time onto the prepared baking sheet. Flatten slightly to about 1/2 of an inch thick. Bake one sheet at a time until lightly browned, 12-14 minutes. Transfer to a wire rack to cool and store in an airtight container for up to 4 days. So great to hear that despite her body failing she is still in good spirits. Kim, as touching compositions go, this one is poignant. Mothers seem to muster the greatest amount of valor when faced with terminal disease and your words about Shelby proves this. I suspect you'll always think of these cookies in a most special way. I know I will. This looks like a great breakfast idea.......I'm always looking for something on the fly....thanks! What a wonderful post! What an inspirational woman to all! So sorry to hear about your friend's battle with cancer. She seems like such an inspiration, though. I pray for her family to continue to be strong and you are wonderful for providing a ray of sunshine during what, I'm sure, is a dark time for all those who know her. I'm sure the girls smiled as they ate these breakfast bites. oh gosh, did this hit home, and brought me to tears. I know this all too well, as I sit here by my dads bedside in the Cancer Tower of Providence (we are eating dinner together, me a granola bar and him via g tube!). I am so sorry for your friend, it is such a difficult struggle for everyone involved. I send her peace, positive energy and ... peace. she will be in my prayers. So sorry for your friend! Cancer is like the nightmare of today's world and it is really unbelievable how there is no ultimate solution for it in this century! Will pray for your friend! You have a great blog, and this was very inspirational :) I wanted to let you know that these cookies are delicious! I just bought some local honey that I've been wanting to try, and it went perfect in these cookies! Truly sorry to here about your friend. A friend a nurse I worked with recently lost her fight with cancer at the age of only 40. I made the cookies with Almond flour so they would be gluten free. They are slightly crispy on the outside and soft inside they are amazing. The next time I make them I may add some finely chopped pecans. Thanks for the comment!! So glad to know that the gluten free version was just as tasty, I think I'm going to give that a go! Cancer has been making its presence known lately, too many people have been suffering. I'm so sorry for your friend as well... 40 is so young. That was one of my favorite ways to eat it too!! So glad you like it. Facebook me a picture if you get a chance!!! Looking forward to making these for my daughter and sil to take for breakfast when they go to work...while I stay home with the granddaughter...12 weeks. kdewb... enjoy!! What a wonderful grandmother you are. My mom did the same for me! Enjoy your time with the little one!